From 1942-45, the Japanese incarcerated more than 2000 captured Australian and British military personnel in a prisoner of war camp just outside Sandakan. In January 1945, orders were received to move about 1000 of the prisoners into the interior, following a rough track through swamps and jungle and across rugged mountain ranges. These forced treks, which claimed many lives, are now known as the Sandakan Death Marches. The final destination, for those who survived the 240-kilometre trek, was Ranau. While most visitors with an interest in wartime history now know that prisoners were held at a campsite near Ranau town, few are aware that there were two other campsites in the vicinity, known as Jungle Camps. In 2005 Tham Yau Kong, of TYK Adventure Tours, working in close collaboration with Australian historian Lynette Silver, author of ‘Sandakan – A Conspiracy of Silence’, identified the original route taken by the POWs. The following year they began escorting adventurers across this long-lost track. 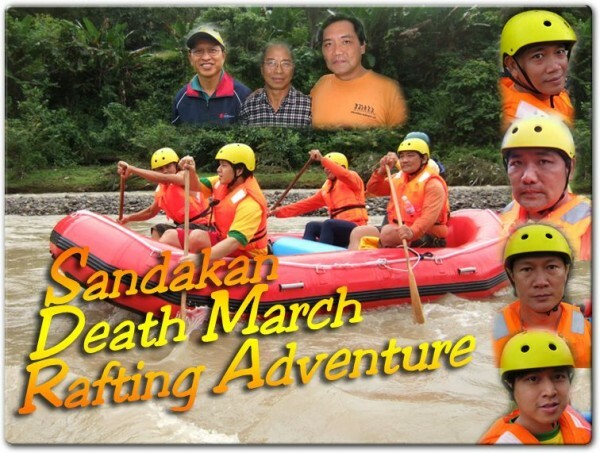 As an extension of this initiative (www.sandakandeathmarch.com) TYK now offers trekkers and other travellers the opportunity to travel by raft downstream from the final jungle camp site at Ranau, to various key places along the very last section of the death march track, part of which followed the Liwagu River. TYK has also packaged a one-night, two-day Sandakan Death March Rafting Tour from Kota Kinabalu, with overnight accommodation at Ranau, situated on the slopes of the stunningly beautiful Mt Kinabalu. The Sandakan Death March Rafting Adventure begins with an inspection of the the camp site, followed by refreshments. For the next five hours, the rafts float down the Liwagu River on a 50-km journey to Matupang, passing through scenic primary forest. This river is classified as grade 1 rapids, making it suitable for people of all ages. Those who prefer a shorter journey have the option of terminating their adventure at Nabutan, about four hours downstream from the starting point. If you want to try something a little different, far away from the normal tourist routes, come with us on a Sandakan Death March Rafting Adventure, along the beautiful Liwagu Valley. Copyright © 2005-2019 Lynette Ramsay Silver. All Rights Reserved.